GeoPaveX is an innovative resin paving system that combines durability and performance with visual appeal. 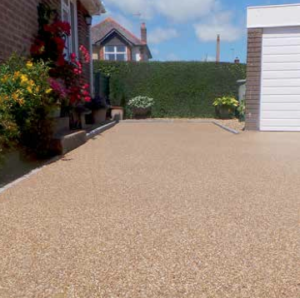 Combining a resin binder and selected natural aggregates produces a decorative and permeable surface that is hard wearing and requires very little maintenance. Select from a wide range of colors and textures, of specially selected aggregate of varying sizes and colors. Couple this with the potential to use other design elements, gives GeoPaveX an extensive variety of options for designing within the built environment. GeoPaveX is a two-component custom polyurethane resin binder that is highly durable, it is a neutral, amber color that is suitable for buff, yellow, and brown aggregates. Through the effects of sunlight there will be some warming of the binder color in the early life of the finished system. Designed for ease of installation, GeoPaveX EzFloat has a consistency that allows a free-flowing application even at lower temperatures. It is exceptionally resistant to discoloration after exposure to light and is suitable for a wide range of aggregates that will create a natural looking, decorative finish. Paving and hard landscaping s frequently require special treatment to ensure that the area immediately around trees (tree pits), in public landscaping are free-draining, yet solid, sound and strong enough to allow inevitable foot traffic. GeoPaveX resin bound surfacing is ideal for tree pit application, as it removes any potential slip or trip hazards, prevents the loss of soil or growing media and stops the build-up of rubbish and litter around the trees. Using a resin bound system can also aesthetically enhance an area and can complement the surrounding paving, according to a specifiers requirement. 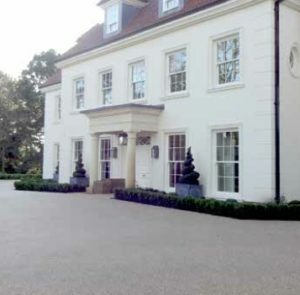 The open texture achieved with a GeoPaveX resin bound systems provides a highly porous surface, allowing the tree roots access to both air and water penetration. Installed with a suitable base build-up and configured for Rain Water Management best practices will avoid the cost of having to install expensive drainage systems. Tree pit systems are normally applied directly onto structured soil or root containment systems, in which the tree was planted. 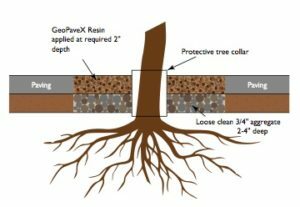 It is recommendedthat trees should be planted and anchored in urban tree soil or similar, on top of that the build-up consists of a minimum 2-4″ base layer that is produced with loose 3/4″ clean crushed aggregate, which is followed by a minimum 2″ layer of GeoPaveX resin bound material. 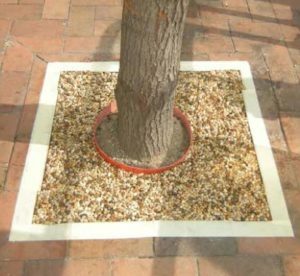 Tree pit edges can be finished with a hard-paved outer edging and should have a protective tree collar, or another suitable edge, that is sufficiently offset from the tree to allow for the tree’s anticipated future growth – especially when saplings are being planted.